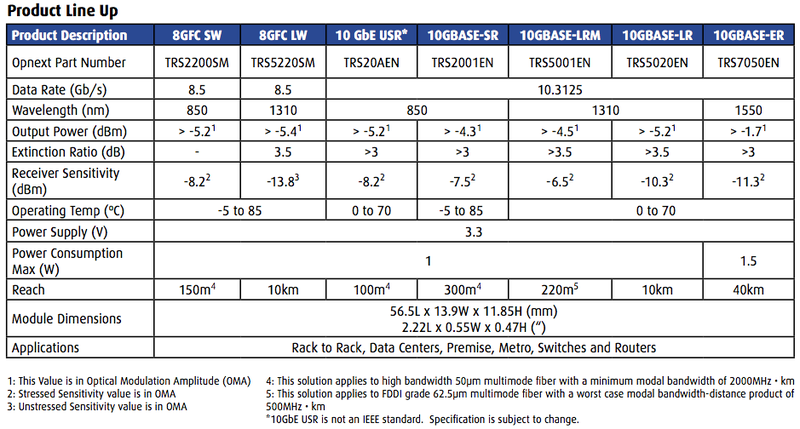 You are here: Home / Blog / What are 10 Gigabit Ultra Short Reach (USR) Optics ? 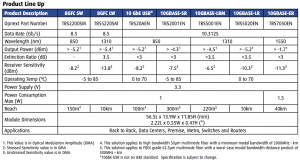 What are 10 Gigabit Ultra Short Reach (USR) Optics ? What are Ultra Short Reach (USR) Optics ? 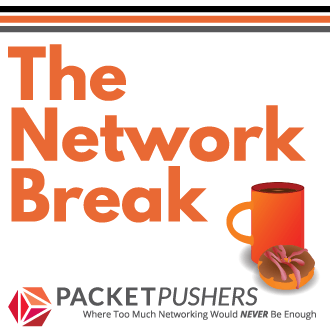 A couple of weeks back I posted this article comparing pricing and features on Cisco Fabric Ethernet Transceivers as a low cost option compared to 10GBaseSR SFP+ optics in when building 10GbE networks – Cisco Nexus 5000 / 2000 Pricing Bundles and Fabric Extension Transceivers (FETs) vs 10GBaseSR SFPs. I still don’t have a confirmed answer but I think I have enough to make some summary statements that might be good enough. I believe that the Fabric Ethernet Transceiver is Cisco proprietary term for SFP+ USR MMF or Ultra-Short Reach transceivers. And that these USR SFP+ units are pretty widely available – once you know that they exist. The basic purpose of these 10GbE optics is that they use OM3 fibre for 100metre cable length, have low cost, low power and non-standard. There isn’t a lot of information that I have found that tells how these optics are different from 10GBaseSR. Putting together a few different sources I get the view that these are low-cost manufacture Silicon Photonics unit. In this paper from Intel (FTP site) around Page 120, they talk about a MEMS chip using Silicon Photonics with VCSEL that is a of low cost to manufacture because the placement of a certain component is not very precise. This leads to lower laser performance because the alignment isn’t tight enough for use on MMF. This data sheet from OpNext shows the Output power of a 10GbE USR at –5.2 dBm and Receiver sensitivity at –82dBM. In fact this is the only company that seems to have an SFP data sheet and may be the only source for these products. You should note that the USR Optics are non-standard. A search using IEEE and Ethernet Alliance suggests that there is no standardisation under way. The purpose of USR SFP+ appears to be the 100 metre cable length using 50micron MMF ( otherwise known as OM3 ) thus matching the physical length of a copper cable. I don’t feel I’ve gotten to the bottom of what USR Optics are and there are several pieces missing. If anyone has more information about the Ultra Short Range optics, I’d be interested in hearing from you, please email use contact page as I’d like to more about them and how they work. 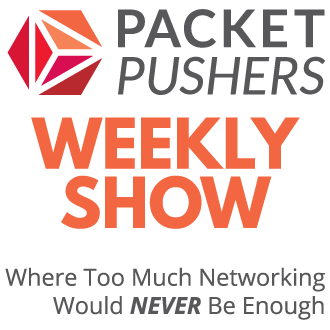 what is “short reach” networking? I liked this part: “Interoperates with 10GBase-SR-compliant devices up to 100 m”… so it looks like you can mix & match SR with USR… ?